From February 14 through the 28, a 24.7 prayer movement was held in a building on my campus. In 2013, two University of Oklahoma sophomores started the movement after discovering the importance of prayer, especially for their school. In its first year, the movement lasted three weeks. Its founders rented office space off campus where students could go and pray all day and all night. Since I’m only a freshman, I didn’t hear about the movement until January through a campus ministry that I’m involved in. I was intrigued by the idea and wanted to give it a try. I signed up for a one-hour timeslot after class one day and used Maps walking directions to get to the building where the prayer room was. When I opened the door, I was wonderfully surprised by what I saw. Brown paper lined the walls and people had written lyrics, verses, and encouragement all over them. There were some bean bags, chairs, and rugs around the room for people to sit on. There was even a speaker in the corner where you could plug in your phone and listen to music. The atmosphere was very calming, homey, and conducive to prayer. Near the door, there was a large chalkboard that said what day it was of the two weeks and what the theme of the day was. That day’s theme was unity. I spent the hour praying, and I learned a lot about prayer. I learned that I often pray selfishly, as evidenced by the difficulty I had praying for others and for unity on our campus. I also learned that the right environment can really impact how I pray. I was reminded of the movie War Room and the closet the lady used as a prayer room. It’s like the prayer room I was in, but on a smaller, more individual scale. As much as I would like to have my own little prayer room, my dorm doesn’t have that kind of space. I have this problem where I want my relationship with God to be super formal. I set aside a certain time for prayer, I pray in a certain way and place, and my quiet times don’t go as well unless I’m sitting at my desk with a cup of coffee. I’m working on it. My point in writing this is to give you some context for the pictures. All these things were written on the paper on the walls. They stood out to me. I’ll explain why for some of them. “Come near to God & He will come near to you.” Maybe it’s the way it’s written or the Bible verse it brings to mind, but it’s just such a beautiful phrase. It’s especially fitting in this room dedicated to drawing near to God in prayer. “Praise Him who relentlessly pursues our hearts!” I love the way it is written, but I also love what it says. God relentlessly pursues our hearts. He doesn’t stop or give up or take a break; He is relentless. “I can see the ivy growing through the wall, ‘cuz you would stop at nothing to heal my broken soul.” This, combined with the ivy vine next to it, sends a strong message: God heals even when it seems impossible. “In my deepest wound, I saw your glory and it astounded me.” It took me a moment to figure out what this said, but once I did I loved it. Astounding is a strong word that is perfect for describing God’s glory. My favorite one, the one that my eye was constantly drawn to amongst everything else, is “Lord, take me to Ninevah.” I’ve never heard anything quite like that before. I’ve heard of people being willing to go wherever God leads them but referring to Ninevah, the place where Jonah was terrified to go, reveals a strong desire in that person to follow God’s will no matter where it leads them. They didn’t just say, “I’ll go to Ninevah.” They took it a step further. They said, “Take me there. I want to go. I want to bring your glory to this unreached place. I don’t care about all the bad things I’ve heard about it, that’s where I want to be. I don’t care that it’s unlikely that anybody will listen to me because I have faith in your power and your influence.” It made me think of how I’m going to Israel this fall (more on that later) and how it is my Ninevah. I’m scared but I’m also excited. I know it might feel like I’m talking to a wall (no pun intended), but I trust in God’s power to use me for His glory while I’m there. I say all this to remind you of the importance of prayer, and to inspire you to take a look at your prayer life and think about how you can improve it. Feel free to comment on what these pictures mean to you and how prayer is important in your life. To learn more about the 24.7 Prayer Movement, you can read the article I wrote for my school newspaper here. This entry was posted in Devotions, inspiration, Personal, Pictures and tagged 24.7 Prayer Movement, article, astounded, atmosphere, broken, come near, desire, encouragement, Faith, glory, God, heal, heart, important, inspiration, Israel, ivy, Jonah, lyrics, Ninevah, others, pictures, power, prayer, prayer life, prayer room, pursue, relationship, relentlessly, students, unity, University of Oklahoma, verses, wall, War Room, will, write. This entry was posted in inspiration, Pictures, Quotes and tagged finger, God, hand, Mandisa, my edit, quote, way. This entry was posted in inspiration, Pictures, Quotes and tagged answer, God, love, Lysa Terkeurst, prayer, Proverbs 31 Ministries, quote, right time. This is an edit I made from a message John Piper gave during the song “Though You Slay Me” by Shane & Shane. You can watch the lyric video here. It’s one of my favorite songs lately! This entry was posted in inspiration, Pictures, Quotes and tagged cared for, confidence, John Piper, message, my edit, New, preach, quote, Shane & Shane, Though You Slay Me, truths. This entry was posted in Quotes and tagged C.S. Lewis, God, kinds, people, quote, way, will. 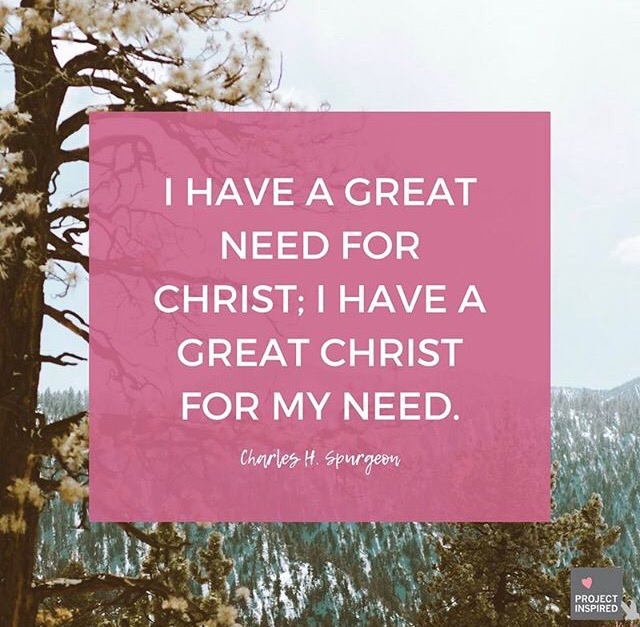 This entry was posted in inspiration, Pictures, Quotes and tagged Charles Spurgeon, Christ, great, need, Project Inspired, quote. This entry was posted in inspiration, Pictures, Quotes and tagged destruction, feels right, First 5, Lysa Terkeurst, Proverbs 31 Ministries, quote, right, sin.